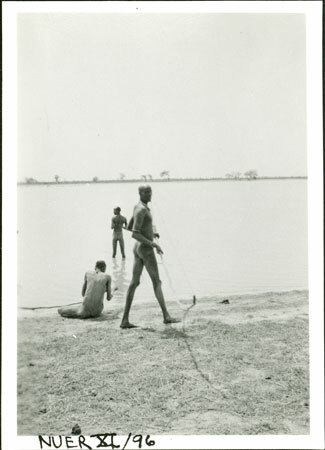 Men on the shore of the lake carrying long harpoons for fishing by wading into the waters and spearing fish, which provide essential dry season nutrition. Note on print reverse ms pencil - "11 124 Fadoi" & print front border ms ink - "NUER XI/96"
Morton, Chris. "Nuer fishing" Southern Sudan Project (in development). 03 Jan. 2006. Pitt Rivers Museum. <http://southernsudan.prm.ox.ac.uk/details/1998.355.544.2/>.